Dianne is a two time jail bird, but for the right reasons,” Joyce O’Neal says about her best friend Dianne Harris. Harris was jailed twice for activism during the Civil Rights movement in the 1960s in Selma. O’Neal, who was never arrested, was also an activist. The two women, who have been friends for almost 60 years, were teenagers at the time. O’Neal and Harris both lived on the same street as the Brown Chapel A.M.E. Church, which they attended, and which was at the center of the movement in Selma. It’s been almost 60 years since the two met. 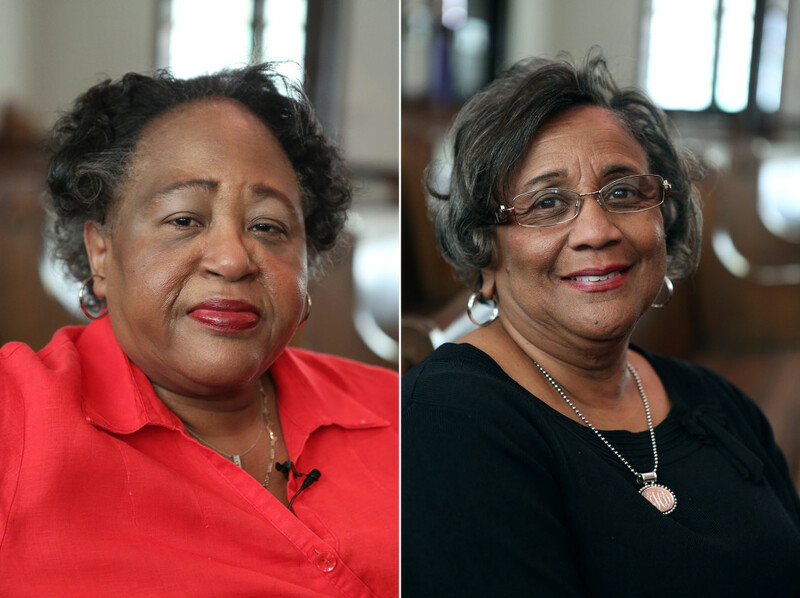 Joyce O’Neal, a former Director of the Food Assistance Program for the state of Alabama who is now a tour guide for Brown Chapel A.M.E. Church and Dianne Harris, an educator for almost 30 years, have been friends ever since. As teenagers, O’Neal and Harris attended separate high schools but still remained very close. At the time, schools were segregated. Students from R. B. Hudson High School, where O’Neal was a student, were coming to First Baptist church and to Brown Chapel A.M.E. Church to join and organize the marches. O’Neal, wanting to be involved, consulted her mother who advised her not to attend school rather than leaving in the middle of the day to join the march. Harris, who attended Alabama Lutheran Academy, remembers being involved in a different way. “We wanted to be part of history… All we needed was a little encouragement. We already had the thrill.” Harris recalls a young man from R. B. High School visiting her school and asking Harris and her classmates, including her younger brother, to participate in the movement. Both women attended meetings at A.M.E Church where Dr. Martin Luther King Jr. frequently spoke. Harris said she never got the chance to formally meet Dr. King, but she made sure she reached out and touched President Obama when he came to speak. O’Neal said the movement started in the churches, and she remembers popular figures like Hosea Williams and Malcolm X attending the mass meetings. O’Neal and Harris were inspired by the leaders and public figures coming to take part in the movement. They have a lot of good memories–but harsh ones as well. After the marches and legislation, life changed. Harris recalls a moment when she first started teaching at a predominantly white high school. During her time there, she was diagnosed with breast cancer. Two of her white colleagues, provided her with support, sanitizing her classroom with disinfectants on more than one occasion to cut down on the chance of infection when her white blood cell count was low due to chemotherapy. “They scrubbed my classroom clean.” Harris says. Fifty years after the marches, O’Neal and Harris are hopeful that the movement was not in vain and Selma continues to improve. O’Neal describes the youth as “not having a clue” when it comes to taking advantage of educational opportunities and community resources available to them in their own town. She blames her generation for not educating young people on the movement. Many young people leave after finishing high school, she explains, because of the lack of industry here. “The engineers, the chemist and the other careers, there was nothing for them here,” she says. The town desperately needs economic improvement but it still has its positive traits, she insists. O’Neal describes Selma as a lovely city with a lot of history. “We have beautiful homes here, beautiful land, and it’s a great place to rear children,” she says. She hopes that Selma’s youth will keep the town moving forward. In 20 years, O’Neal hopes that Selma will be more advanced economically so that her grandchildren, and others, will want to come to here and raise families. “I’m hoping that the movie Selma and the Commemoration have brought enough attention to Selma that now the powers that be are working on the infrastructure such that Selma can grow,” O’Neal says.